Just before Christmas 2005, I purchased a new sewing machine. I decided to buy a Husqvarna Viking Designer SE for several reasons - first, there's a dealer inside one of my favorite stores (Jo-Ann ETC); second, I saw it online and decided that it was the machine for the 21st century; and last, Consumer Reports highly recommended the brand. 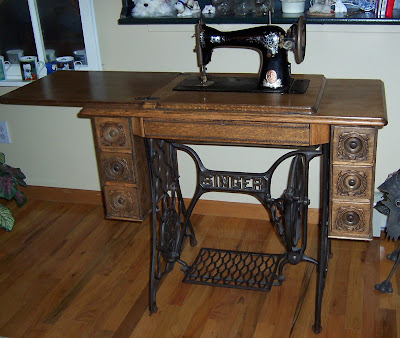 And that machine can do just about anything - sewing, embroidery, quilting. The only limitation so far has been my own inexperience - but I'm working on that. I've been doing machine embroidery for a little over a year now. 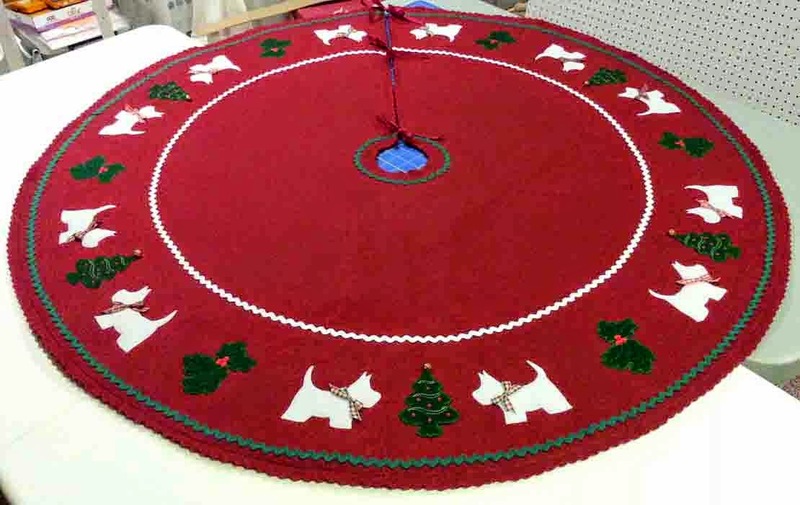 I'm still learning about stabilizers and hooping techniques, which needle to use with which fabric and how to alter designs to suit my project. It's a process that requires a bit of trial and error, but I am having a good time with it. I am trying to learn how to create my own designs -- I have the software that will allow me to do this, but I am still learning the basics. 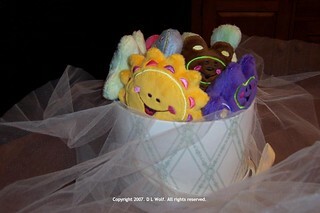 Minkee Pals - One of the first projects I chose for machine embroidery, I could not resist these little "critters", embroidered and sewn completely in the hoop, then hand-stuffed (some of them even have little "squeakers" inside). I purchased the Minkee Pals 2 design pack from Embroidery Online.com (OESD) and the Minkee fabric through fabric vendors on eBay. Minkee is a soft furry fleece type of knit fabric from Benartex. I have made these as gifts for a couple of my nephews/nieces and am told they are their favorite toys. In-the-Hoop Gift Bags - Early in 2007 I purchased these designs from Embroidery Library. These are small bags that are created entirely in the hoop -- the embroidery design tacks down the front, stitches the seam that creates the channel for the drawstring, embroiders the design, then stitches the back to the front. 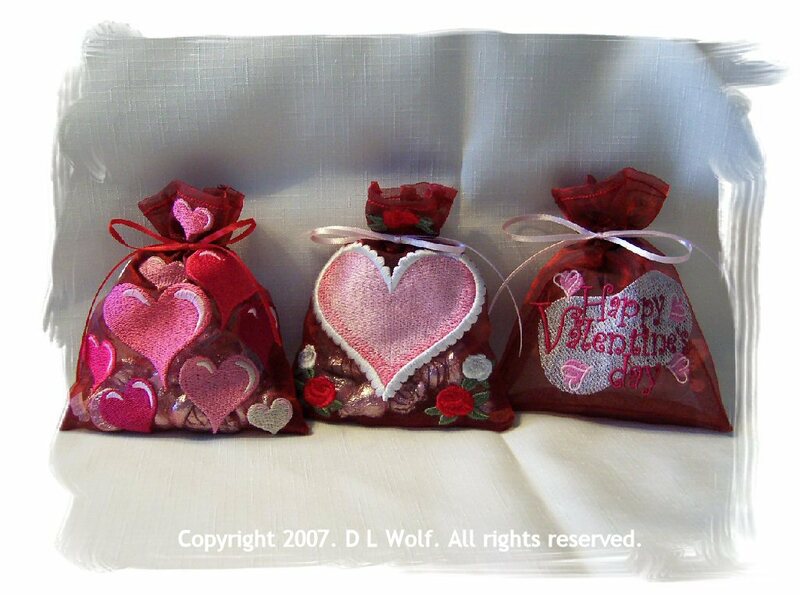 I went a little crazy and made a whole bunch of these before Valentine's Day, and ended up selling a few of them on eBay. They are the perfect size for small gifts like candies, cosmetics or gift cards. 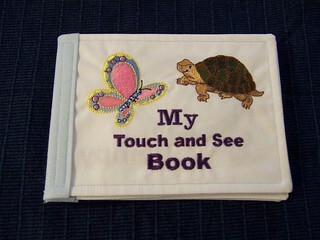 Baby Touch and See Book - This is from a purchased design pack from Inspira and combines embroidery and sewing. Each page of the book is a machine embroidered appliqué design with an example of various textures - smooth, bumpy, fluffy, soft, shiny and furry. After the pages are embroidered, they are sewn together and assembled to form the "book". I have made several of these, and have altered the first page to personalize them with the child's name (for example, Emily's Touch and See Book). The challenge was to find just the right fabric for the appliqué to simulate the texture for each animal. Baby Bibs - I purchased several designs which I have used to embroider on pre-made blank bibs, and I've made some bibs from a purchased pattern.